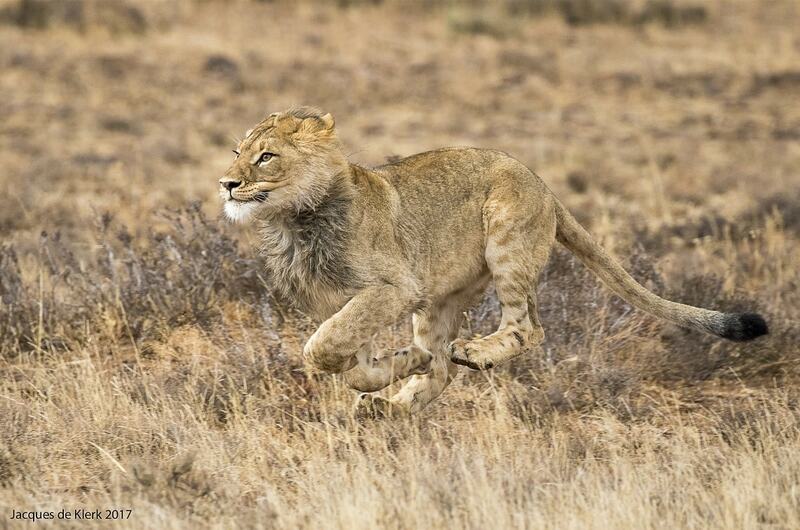 The Eastern Cape’s Mountain Zebra National Park might be famous for its cheetah tracking experiences and Cape mountain zebra, but lions not so much. 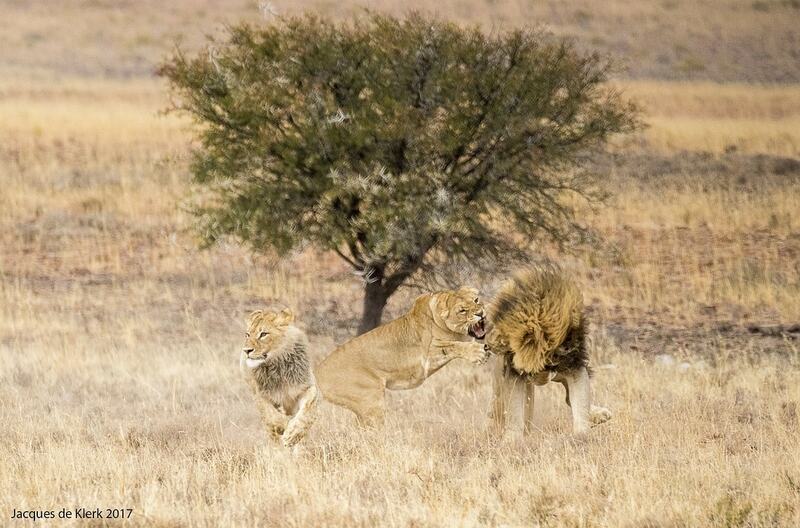 Then in 2013 two adult bothers and one lioness were introduced to the park to help restore certain predator-prey functions. 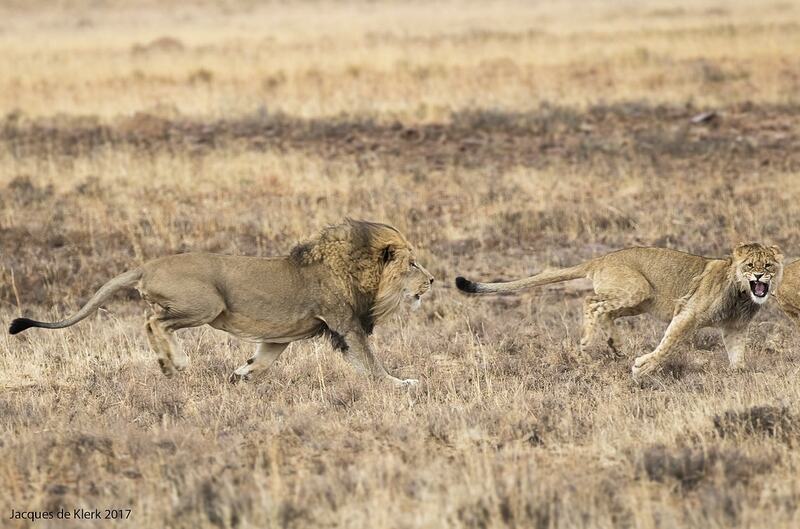 Soon after, in 2015, two more lionesses (sisters) joined the pride and cubs followed. As this month’s photo sequence proves, visitors to Mountain Zebra can now look forward to some riveting lion sightings and interactions. Wild Card member Jacques de Klerk arrived at the park as gates were opening. “We immediately headed for the plains. On our way up the hill, we came across an adult female and a male lion moving from the waterhole and across the road. As the lioness was constantly rubbing against the male, he stuck by her side. We watched them walking around and lying together for quite a while, but no mating,” says Jacques. 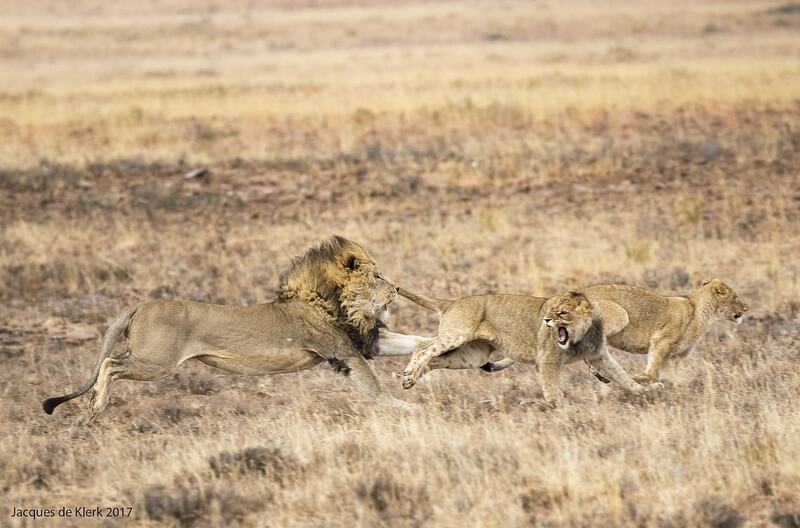 The adult male quickly leapt up to defend his turf and headed straight towards the valiant young male – his mane still just a patch of fluff. The lioness, a first-time mother, was introduced to the park in 2015 at about three years of age. 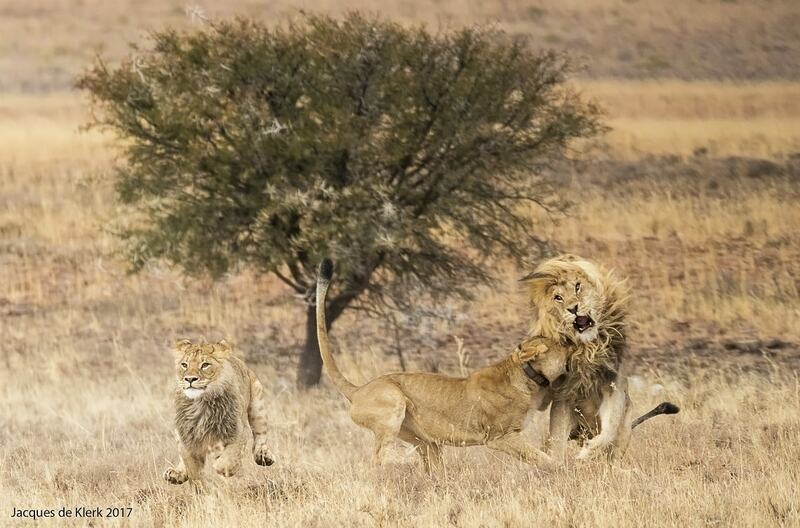 Either the pictured adult lion, or his brother, could have fathered her three youngsters. “The three now sub-adults were the first cubs to be born in the park,” says Megan. 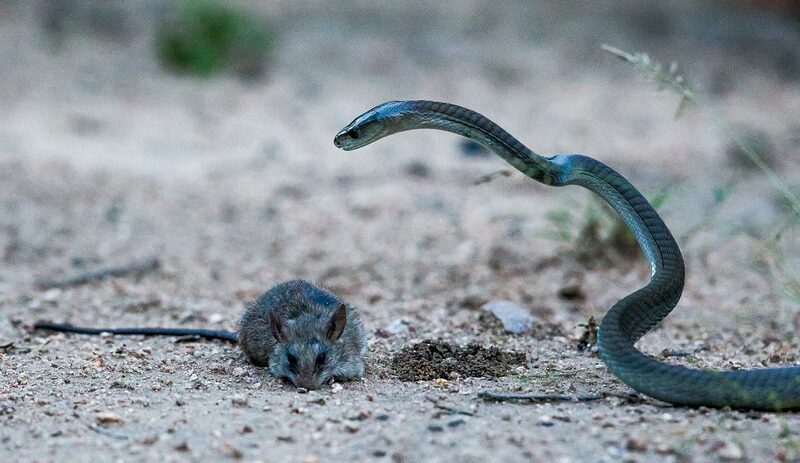 Amazing footage by this photographer! One can but only wish and dream to witness this one day! 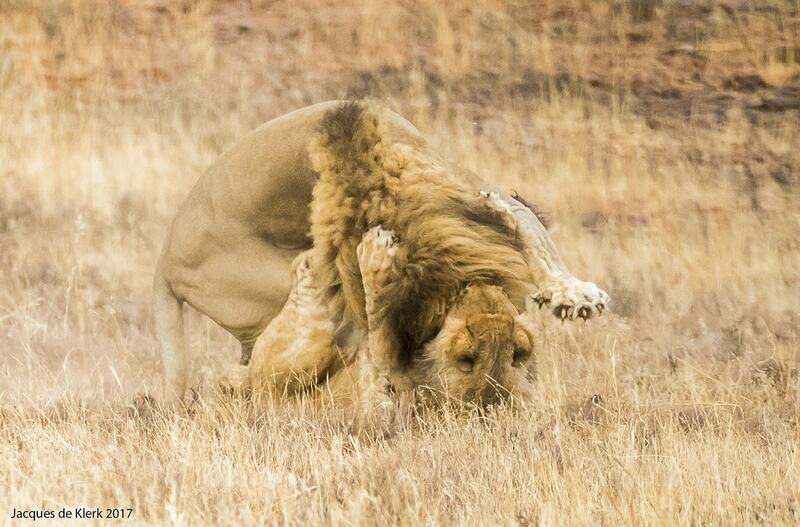 We were in Mountain Zebra Park in 2016 and were the first at the area where the male and female lions were mating. It was just before 7:00 am and we sat for hours with them taking photo’s. 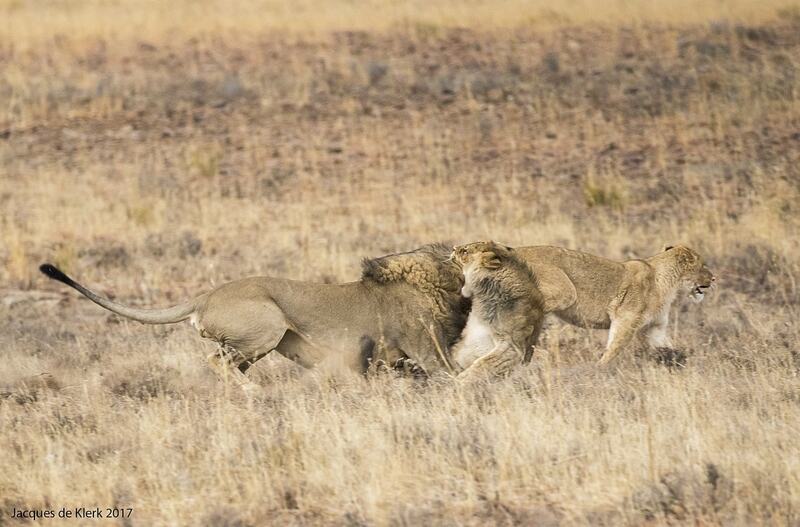 the other male lion was lying a little way from them but was in a bad shape – he and the other male had obviously been fighting . And last year in Feb 2017 we were back at the park and there we saw the little cubs far off the road under a tree playing with each other and the mom and ‘aunt’ was with them and the 2 male lions were lying a little further under another tree. It is good to see how the little cubs have now grown and the one that got into ‘trouble’ now is really a handsome little one – he will be a great adult later on – his mane under by the neck is looking really good at such a young age. Unbelievable footage and what a sighting! What camera did he use – great skills! Thank you for sharing your most amazing experience. Such a privilege to witness a sighting like this. An amazing park, very well run, we just love going there. Well done to all staff and management. We experienced one of the best ever night drives at Mountain Zebra Park. Such crisp clean shots – well done. 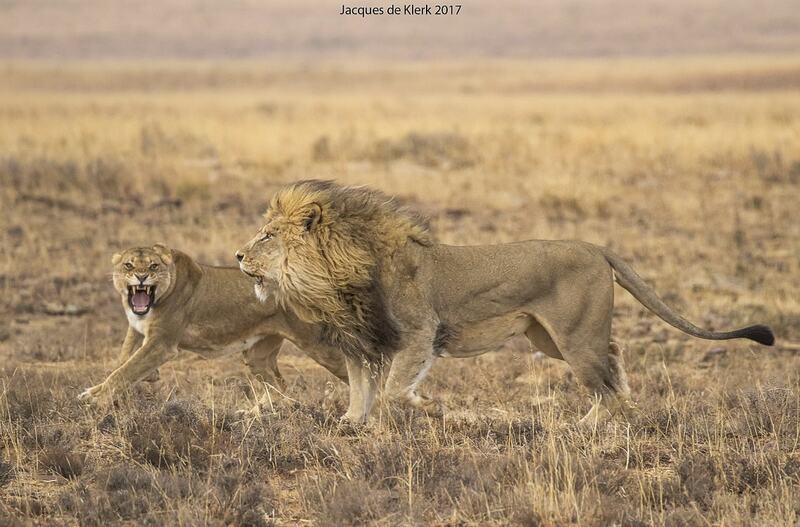 Looking at the first one of the charging male lion, it almost looked as if it had been “photo-shopped” into the picture being so crisp with definite outline, especially around the mane. Must have been shot with very high speed shutter ?? A really great sequence !! 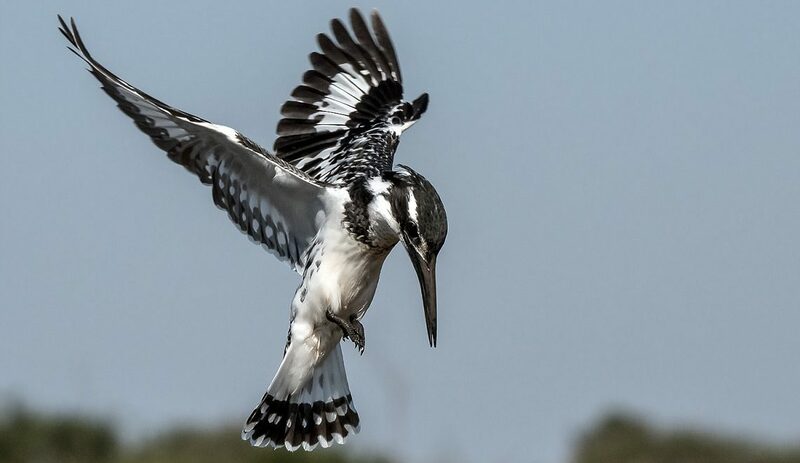 Pragtige aksie foto’s van leeus! Amazing footage & sighting! Awesome! Wow amazing sighting , fantastic photography . Congratulations.